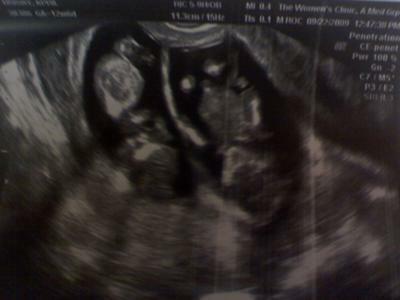 Baby B on Left, Baby A on right. We found out Baby B was a boy on this date! In this ultrasound you can see the boy's VERY clearly, I had some bleeding and they were concerned about the cervix so they conducted an "internal" ultrasound. I thought this was a great ultrasound to share with everyone because you can see so much so early! We will have twins, now they are at their 13.week. But my wife has terrible aches. and she cant eat anything. How long will it take? Please, if you know how long this will take with aches and when she can eat something. Isnt the docter suppose to give u a ultrasound to find out how far u r and to determain if the baby is growin alright. im 11 weeks pregnant and already starting to get a belly, my boyfriend has twins in his family, so im dying to find out if it is or not. My doctor has already told me that he wont be sending me for my 1st ultrasound until im 16-18weeks pregnant, is this normal? Well, we found out at 20 weeks that baby B is actually now a girl so one of each! I guess no one can tell you for certain until they are born lol. But we are preparing for one of each lol. I am about 12 weeks and 5 days today, and I have an appointment on Monday Nov 30th. I really hope the "new general rule" of a sonogram at every appointment for twin pregnancy is applied... I want so badly to be able to find out the gender(s). I've even resorted to old wive's tales and techniques, though I can hardly count on their accuracy. Like I said, I can't wait!!! I might get a little hint as to whether or not they're fraternal or identical. Congrats and man that is real early to know the genders! WOW Tomorrow I go see my Specialist and I am going to ask them if they can take a peak to see if they can see anything! I will be 12weeks 4 days so maybe! We will see.